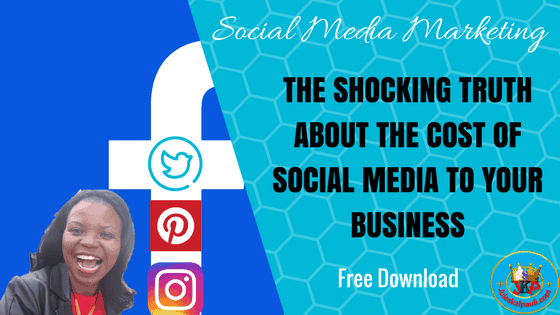 You are here: Home / Social Media Marketing Tips / The Shocking Truth about the Cost of Social Media to your Business! Measuring revenue isn’t easy. We get it. But the other critical measurement in your business is well within your reach: cost. We are specifically talking about the cost of social media to your business! In today’s episode, we are going to dissect your social media Return on Investment! And you are investing something on social…its called TIME! How much are you spending on social engagement? Ever thought of that number in terms of cash? I tell you now, you need that number. 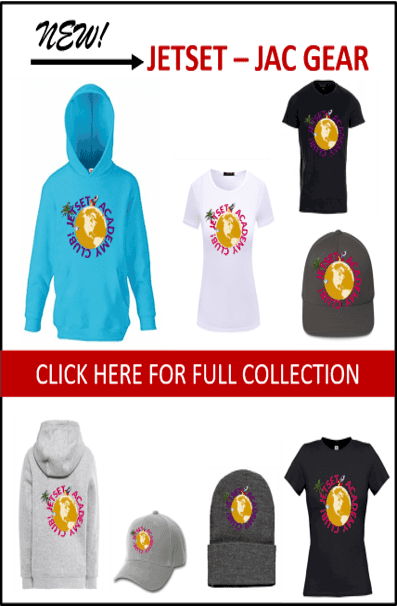 Are you buying prizes for contests and giveaways? Could a brand have “Gifted” you a product as a giveaway, so you are going crazy promoting it all over social…Yup! Maybe you are paying an employee, virtual assistant, agency or contractor to engage on social media for you or for your social syndication! I know that we do outsource a lot! If the above sounds like Greek to you, you need to Download our 4-C Formula Productivity Workbook. Better still, you should be very excited for my book coming soonest. I lay out these things in a fun detailed way. So, I recommend you get your name on the pre-launch list. measure your efforts and results. After all, how will you know you are succeeding if you don’t have a clear goal for your social, or track your actions? All those downloads you pump out, the number of people who join your email lists, the audience that pops over to your website? Do you know the number? Last week we talked about business planning secrets, so this follows on perfectly! Now don’t tell me your goal is just likes and shares…You can’t pay your bills with those. So, you want more for sure. Like Optins and Sales, that’s the juice! I cannot tell you enough how, a total waste of your cash it is buying Facebook likes, Twitter followers, Insta-followers, etc. 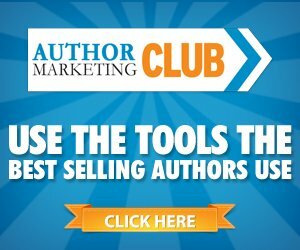 It would be a better use of your $$ to pay for website clicks! You do create content, right? Put a price on that time. Advertising…Now we are getting real serious here! But why should you even bother doing this? Because you want to DECIDE on which 1-2 Platform/s bring you the best ROI. You then focus on just those 2, and simply ignore or have a presence on the rest! How much Business does your Social Media Engagement Cost? Download Your Facebook Cheatsheet Here. Did you know that even if it’s just you pinning, tweeting and Facebooking, (is that a word) you are still spending money? What value do you place on your time? $40 per hour, $80, $100, or is it $500 per hour? Multiply that amount by the number of hours you spend engaging on social media, that’s your cost. She values her time at $80 per hour. She is pretty serious about her business as she runs a small cottage industry. 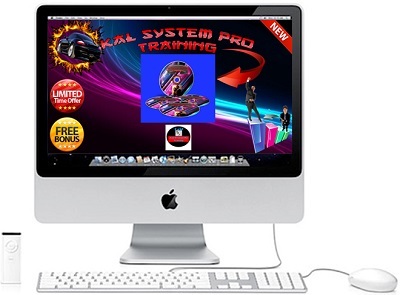 Therefore, she set aside a budget for marketing and advertising. Her budget is $3200 per month. Yet, when she came to us as a JetSet Academy Coaching client, she had no idea that beyond her ad budget she was spending more. Hailey had not internalised the additional cost of social media to her growing brand! Following some discussions and calculations we advised her to; at the very least calculate a measurement called Cost per Engagement over a particular period of time. You do this by adding all social media engagements together and dividing your spend i.e. TIME by that number. Remember Hailey had to manually keep track of all her engagements in the month of October to the 27th. Because February only has 27 days sometimes. ? Trust me Hailey did not want to do the manual labour of adding up all her shares, likes, comments, tweets etc. So, she outsourced it, good girl! Anyway, we also got Hailey to do a cross channel comparison. What the heck is that when its at home Julie Syl? Time spent doing that across two or more Social platforms. You can do the same on Twitter, Instagram etc. 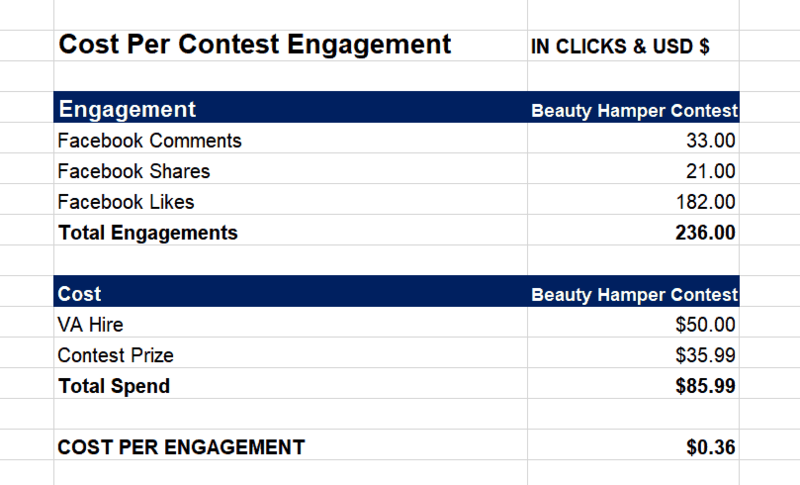 Your Facebook contest spreadsheet might look something like the one below. 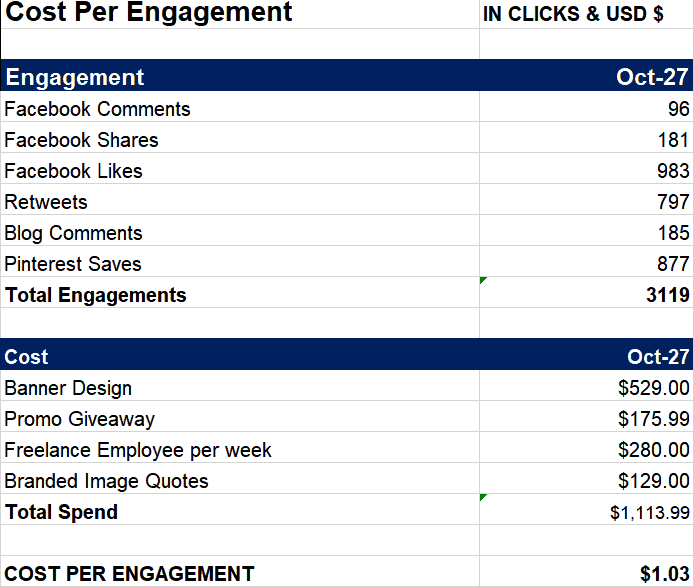 Again with a Spend of $85 Divided by Total engagement 236: 85/236 = $0.36 cents per engagement. Do you see what both we and Hailey saw? The contest she run and tracked cost only $0.36 cents per engagement. 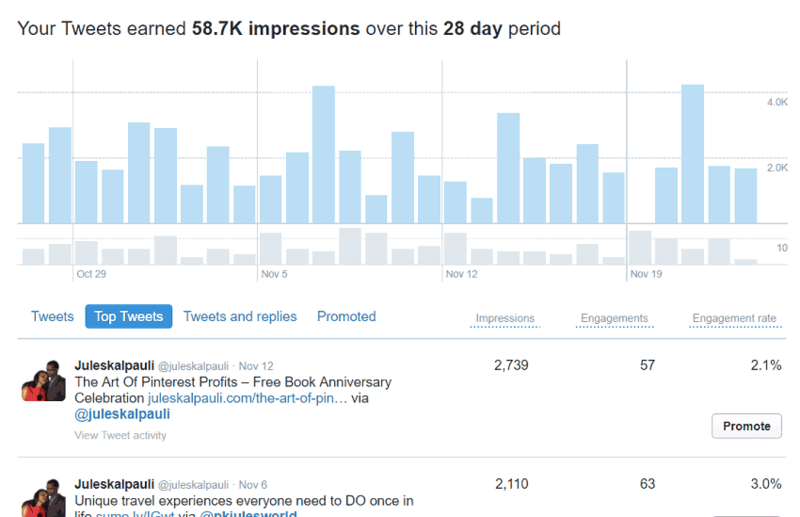 On the other hand, the overall cost of engagement for her organic social media reach for October was $1.03! The Contest is/was scalable and she could see exactly what to do to. Either trash it or tweak it for better engagement, rinse and repeat. She could even create a Facebook Ad or boost her giveaway if she wanted. By the way, her aim was to build her list and customer base. She got 79 optins, 30% of whom made orders and 2 are now her Affiliates! In other words she has got 2 new distributors of her products! Duplication, hurrah! Remember you have to be social, engaging, connect with more people, and communicate effectively to get the kind of results Hailey got above. Plus of course have the right giveaway for the right audience! There are too many bloggers, small and home business owners looking for more engagement while giving way too little! So, what does the above Case Study say to you? Maybe you should run some or more contests, do events, promos, run Ads etc. 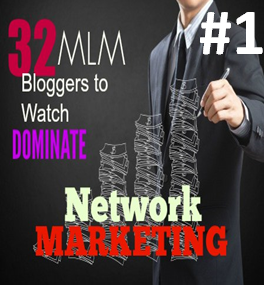 If you are serious about your brand and creating a life changing income! Should I hire a VA or Assistant to do my Social admin and management? Should I run more contests on our Social media e.g. Pinterest, Instagram, Facebook page? Should I pay an agency $500-2000 per month to run my Facebook Ads or manage social media accounts? Does hiring a graphic designer improve my social engagement? Should I hire a Coach to help me streamline my online business for profit? Should I run PPV/PPC on Google or any social platform? Is this Platform for me? And when you make a decision, be confident about your goals and results. Be open to receive exceedingly abundantly more. Because we only receive what we expect and walk towards. Track your actions and results. Be sure to Add the cost of Social media to your annual tax returns in the picture shown above, otherwise you can’t justify it to the tax man! ? This is the only way you can get it as a Tax write off! Meaning more cash in your own bank! And that my friend is what social media costs you! What we measure we can track and know when we are in the green zone! We can then make better decisions that affect our Income and business expenditures. And live more meaningful lives away from the PC and blue light! 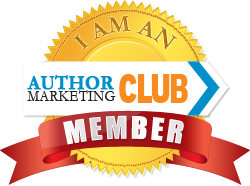 The Attraction Marketing Formula that will change your online endevours to desired Results – Learn More. How to Make Social Media Pay You – Learn How. Why Pinterest is Your Traffic Go to Resource Today – Find Out. Social media is the key to business success nowadays. Glad you’ve been able to stay afloat. This post was so insightful, I really learned alot about social media and ROI. It is definitely something I am going to look into! I have been thinking about paying for ads on Facebook to boost my post. This post is really helpful. Luci, ONly do so with Professional help or training otherwise it may not be as profitable as you wish. I wish you every blessing on that front ! I like your tip to run contests. I do that, too – but it’s important to be careful with this because it doesn’t always spawn true authentic engagement. Thank you for sharing this case study, it does make you think if you are really working int he most optimal way. Many small business owners are literally on social media all the time, managing it in-between, without realizing how much it takes away form their other responsibilities, where they could bring even more value. Definitely something worth thinking about. Wow! That was a lot of info! Thank you for taking the time to break it all down. Social media is ALWAYS changing. It’s hard to keep up. I have not invested nearly enough time to grow my blogs or my businesses, and most of what you said here is like another language to me! I definitely need to bookmark and come back to this post to read and reread it to gain greater comprehension and learn to implement some of these strategies and tools you have discussed. Thank you so much for creating something unique and so insightful! Bookmarked and referring back to a 100 times I’m sure! happy to share. We all start from Zero and grow our way through a myriad of resources. Go enjoy these new ones, build your list and sign your own checks! 🙂 Feel free to holler if you need any help Kylie! This is such an interesting article to come across. Just the other day I was talking about promoting on social media. This came at the right time. Social media can definitely get expensive when it comes to your business. It’s important to figure out what’s worth the money and what’s not. Very good food for thought. When I think about my investment in social media, I certainly do not consider the time spent. Thanks for the great information. We hosted a Giveaway once on this platform and that was it…Lots of work, not enough long term rewards as he traffic is NOT the kind that returns after the giveaway! Time is the Precious gift we have to treasure and thus portion out! Once we use our time productively, we get rewarded with wealth! THis is SO good! So informative and super important to keep track of our social media. I really like the permission to focus on the one or two venues that are most productive for our own business and just maintain a presence on the others…because there really is no way we can do everything. WOW! What an insightful post –– I feel like half of my day is invested in social media to be honest for different facets of my professional life. It gets exhausting! I am interested to track my ROI now that you pointed it out. It is very time consuming. Time is what we all got and we must prioritize it Shannon! I definitely have hired virtual assistants to help boost my social engagement. I have found them to be extremely helpful. Wow, people really do need to start looking into more effective ways to advertise and run their blog on social media! This was very informative!! Someone asked me the other day how many hours I work. And I stopped and thought about it. Literally all the time. It’s crazy! 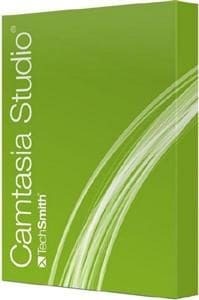 It is sure crazy inst it Jenna…Question is Do you enjoy it and is it WORTH IT? This was very helpful! I’ve been seriously underutilizing all the tracking tools. Plus, I’ve never thought about recording $$ spent on Facebook ads for tax purposes. Thanks for the tips! Social media is so effective when it comes to online marketing, but it gets you burnout doing all the stuff everyday. Outsourcing can be of huge help. This is a ton of interesting information that you have here. I have a lot of things to think about when it comes to increasing engagement, time and money spent and the like. I don’t know how to feel about it all exactly, but it is interesting anyway. Wow! This is a wonderful post! All bloggers should really read it. I will totally share this with some. 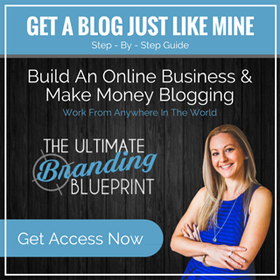 I had never seen it put this way – a LOT of great information for bloggers at all levels! This is a great breakdown on the effects of social media! I am pinning this to refer to!! This is such a useful post for a blogger! Really enjoyed reading it, so very interesting how social media is developing so fast! Wow, this is mindblowing! It is so interesting to learn so much about how social media keeps changing. Yes you do Ashley your time is precious and there are people looking to serve you for a small fee! You nailed it! My husband and I were actually just talking about this because he’s about to go on a very important board meeting, which he was also going to be discussing a little about the effects of social media on their business. I love this breakdown! Social media and business. It’s a constantly changing combination. [ Smiles ] If a person wants to have a successful business, they might as well go all out on social media! I started the whole thing wanting to have a presence on every social media channel available, big mistake! Now I’m focusing on Pinterest and Facebook since it seems that is where the money is 😀 I’m a graphic designer myself and have some knowledge on marketing so at this point for me would be unnecessary to hire someone, I will consider it in the future as social media takes a lot of time and effort! Social media really plays a big part for online business.. And as we all know, growing and maintaining our platforms is indeed a struggle. 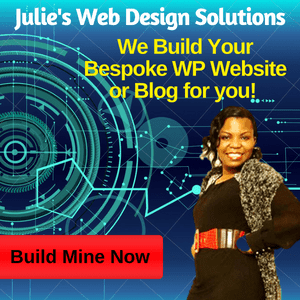 I’ve been think of ways how to start my business, and transform from a Va life into an online entrepreneur, and I think Julie just gave me the right idea how to start. I am so glad you have found your path and yes you can. Social Media is a Blessing to many, we gotta spread the Joy! Scared is chicken Kristen…Go check coz you could surprise yourself and Guess what…less Tax…kerching! Tracking your progress is very important. Tailwind and Google Analytics are some great essentials to have when you start out, it can be a little overwhelming. Overwhelm is the work of the enemy…it means you are biting too much, Scale back, take smaller steps, do a little less, that leads to your big picture. It is well Nadalie! Social media takes a lot of time to get under control and be able to constantly put out amazing content! this is a great post! 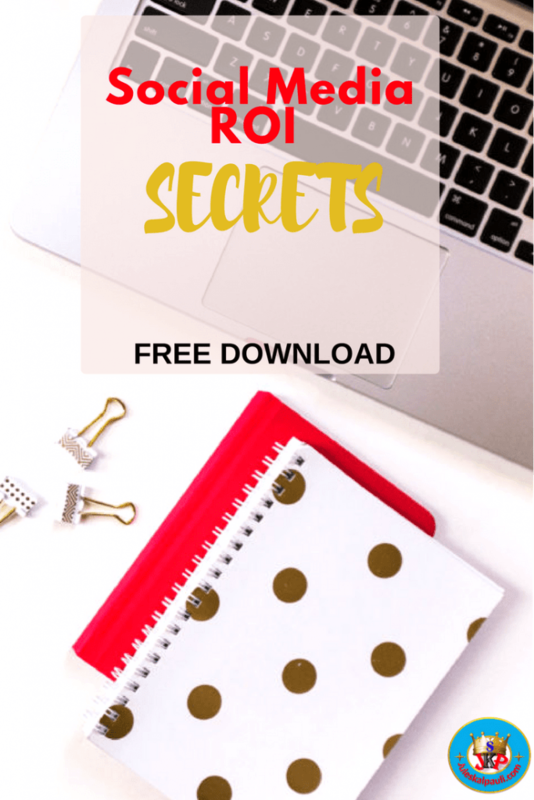 there are so many hidden costs to running the blog! Glad you agree Kimberly, and we are talking Business! You are right in point with this! If you’ve got no way of tracking your return,, you’ve got no measurement, and won’t know what’s working or not. There’s so much juicy info in this post, will bookmark and share it. Thanks!! ?? We are glad you agree and Yes what you dont keep an eye on, you cannot know when you hit break even and Profit in your business! Social media has legit changed the game for EVERYTHING – if you do not keep up with the times when it comes to social media…. That will be the end of you and your business or whatever you’re trying to promote! When I started working at my prior job, I realized there was no tracking being done on social media efforts. They didn’t know what was working and not, and they were wasting time and money on campaigns that weren’t succeeding. So you’re 100% right – tracking is vital! Social Media has become one of the key factors in the success of a business. Apps that can make my scheduling of posts easier and effective are what I always look for. Great post! Wow, I know I spend a lot of time doing social media, but never thought much about how much it costs me and to calculate my ROI. I’m going to have to track this a lot closer now. This was such an informative post! I definitely need to be better about tracking my successes and failures. That way I will know what is working. That really makes a difference. I think I live on social media if not one than the others. Here it is 8:22pm and I have been doing this kind of stuff all day give or take an hour or two when my granddaughter stopped to visit. Might you spending too much time on Social Gladys? Are you getting a ROI on that time you spend? I sure hope so! Wow. What a big difference that was! $1.03 against only $0.33 per engagement! I really have to free up some time to give my blogs a deep study and see how I can push it further with less cost. Thanks for the article, Julie. Learned something again today. This is really great. I do agree that scheduler apps are wonderful to help, I have a few and plus we developed a few platforms to help bloggers and business owners too. I am currently in love with Tailwind for Pinterest scheduling but I also use CoSchedule for all social media platforms for my blog posts. Glad you shared this, should help many people. Social Media plays a big role when it comes to business. I invest a lot of time and money with my social media and I really need apps that can really help me with my work. Thank you sharing it is all worth reading for. As a full-time blogger, I really need to start to invest in more services to free up my time. You gave me so much to think about! And I really appreciate your insight. Hello Monica, yo do that and holler if you need some help! 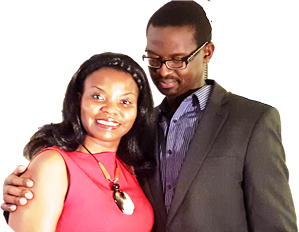 Great post, I have read your blog and its worth reading. Truly, we are investing lot of money and time on social media to increase the visibility and followers. Learnt a lot of things. It’s true. Social media works as vessel to grow businesses in a greater opportunity. It might cost a bit but it’s sure your business reaches a wider scope of audience. That’s why it’s really useful. This was an informative post! I totally agree that it is important to plan and measure your social media usage and the costs associated with it.